It's Architecture Month in Hobart and over the weekend many buildings both public and private, were open to the public. You can have a look at some of them here. Alas, many places were already booked out even before the brochure was published and the times of several which I would have liked to see, clashed with others I wanted to visit. From the website, you will see that Hobart certainly has a range of intriguing architecture. I have visited or mentioned some of these buildings such as the Markree House Museum or the charming Egyptian -style Jewish Synagogue previously, and for a short time we lived opposite the Tate House in Taroona, so I thought I would just take a peek at the Hill Street Reservoir which is only a short walk from my house. Alas, this too was already pre -booked out, but after a bit of pestering and pleading, Taleah agreed to let me know if someone failed to turn up and I managed to go on the last tour of same. The exterior of the Hill Street Reservoir and Pump Station which I pass on my way to the local shops, had always looked rather grim and Alcatraz –like with its high fences, barbed wire and intimidating “No Standing” signs, so I was quite curious as to what lay inside. Besides, I have always been rather intrigued by our industrial heritage. The grand houses and stately homes are usually well -preserved and much is known about them, but our more utilitarian buildings are only now starting to be appreciated when we have lost most of them. I think of the charming power station on Lake Margaret with its brass fittings and clerestory windows, or the gracious lines of our early, usually Art Deco Hydro buildings or the quaint pump houses in the Derwent Valley, so my expectations were rather high. [In regard to Art Deco, see for example, the Jet Service Station built in 1936, number 26 in the brochure, which was also on show]. In terms of the beauty of the architecture, the reservoir didn't exactly leave me breathless. Only function and necessity have dictated its form, but there are some intriguing details. For instance, as Damian, engineer with Taswater explained, in the early days of the colony, when concrete had not yet been invented and the colony had little limestone, Aboriginal shell middens were burnt and used to make mortar to line the brick cistern. If you look closely at the walls of the first Hill Street Reservoir, built in 1862, you will see bits of shells and burnt wood. Unfortunately, these walls leaked like a sieve and as Hobart grew, a second reservoir was built in 1883. By this time, materials had improved and this one still serves as auxiliary storage today with most of the old reservoir now occupied by a pumping station built in the 1980s. This regulates flow to various parts of Hobart and provides supplementary water from the river in summer when mountain supplies run low. The style of the pumping station is utterly Spartan with no concession to any artistic sensibilities at all. Its most remarkable feature beyond a mundane collection of pipes, valves and gauges is its very neat cleaning station, but perhaps that’s a comforting thought. Incidentally, Taswater staff have noticed changes as the climate warms – not just in the greater need for back up supplies, but also the increasing growth of algae and other organisms in our catchments, which mean far greater costs to keep water clean and pure. 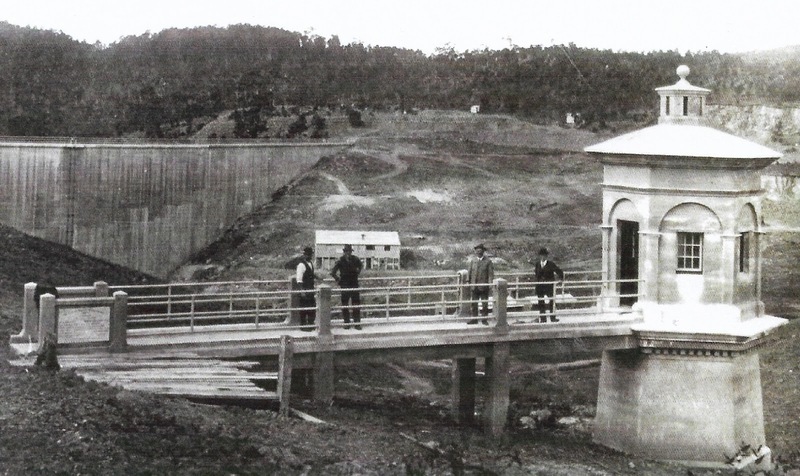 Regardless of its architectural merit, the Hill Street Reservoir plays an important role in the history of Hobart’s water supply -an intriguing story in its own right, and one which we often take for granted. A visit to the original pumphouse at the Waterworks Reserve is very instructive in that regard, or as you walk along the Pipeline Track either from Ferntree to Ridgeway or up to Wellington Falls. In my case today's tour at least represents a mystery solved.